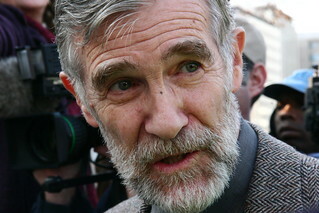 Ray McGovern was put on the State Department’s Diplomatic Security BOLO list– Be On the Look Out– one of a series of proliferating government watch lists. In 2011, at George Washington University during a public event where Clinton was speaking, McGovern stood up and turned his back to the stage. He did not say a word, or otherwise disrupt anything. University cops grabbed McGovern in a headlock and by his arms and dragged him out of the auditorium by force, their actions directed from the side by a man whose name is redacted from public records. Photos of the then-71 year old McGovern taken at the time of his arrest show the multiple bruises and contusions he suffered while being arrested. He was secured to a metal chair with two sets of handcuffs. McGovern was at first refused medical care for the bleeding caused by the handcuffs. It is easy to invoke the words thug, bully, goon. Ray McGovern is not the kind of guy to be stopped and frisked based on State Department retaliation for exercising his First Amendment rights in Post-Constitution America. He sued, and won. Peter Van Buren writes about current events at his blog. His book, Ghosts of Tom Joad: A Story of the #99Percent, is available now from Amazon.